Being an urban homeless person, getting through the day to day life is difficult. The problem becomes much worse during the winters. In addition, keeping in mind the crime among the homeless, you would never want to opt for a homeless shelter. 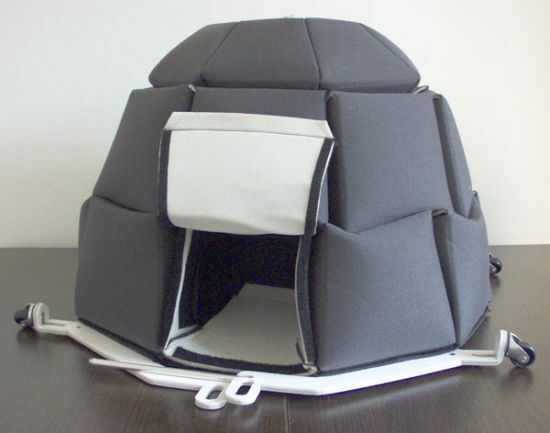 One of the only workable solutions to this problem is opting for affordable shelter like the I-gloobox, which can stand even the rough winters. Nomadic life full of uncertainties may allow an opportunity for vagabonds to curb their adventurous spirit, but one cannot resist the furies of nature without proper shelter and equipment in winters. Making the life a bit more comfortable for nomads, Bulgarian designer Georgi Djongarski has come up with a tent named the “i-gloobox” that provides a safe refuge in harsh weather conditions. Consisting of two main parts, pockets made out of thick waterproof fabric linked together with sticking band and a cart finished in folding plastic or aluminum, the portable tent is easy to carry and install wherever you need it. When combined together, the pockets strengthen the tent to stay firm even in snowy storms. In addition, each part of the tent can be replaced reciprocally with the other to ensure easy maintenance on the go. It’s only when you lose something do you tend to value what you possess. Only then you understand what it is for another person to lose something, especially a home! Julie Martin too lost everything to Katrina, the monstrous hurricane. It’s after that he realized the importance of an affordable small home. One that could be within the reach of one’s pocket. This gave birth to ‘Fresh Start’, a brilliantly built structure on four wheels. Martin has gone a step ahead by creating a company called the Martin House-To-Go. with the primary direction of Jay Shafer of Tumbleweed Tiny Houses. The idea is to create small houses that can be easily transported from one place to another on a trailer. 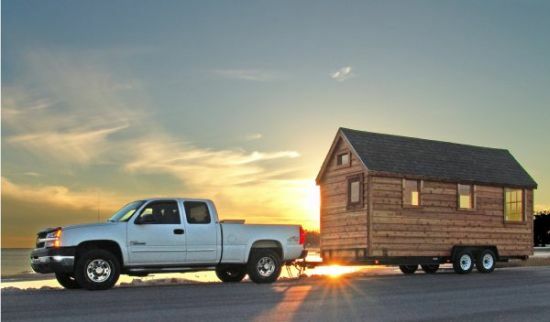 If you hate to travel much, then you can simply remove your lodge from the trailer. You can put it on some sturdy base. Fresh Start is the latest model to be launched in 2008. It can be your abode for $29,900, which stands as the introductory price. All you need to get yourself is a 3/4 ton truck with a 2 5/16th trailer hitch ball. Then, you can constantly change your surroundings according to your desire. The house comes complete with an excellent quality bath, kitchen and a loft. If you are the one of the adventurous kinds, you can avail one to give vent to your roving spirit. Otherwise, use it as a vacation retreat, or a pace to put up your guests. Whichever way you use it, you certainly get the liberty to change your neighbors. You are not supposed to accept the nosey ones, as they are! Sometimes short term simplicity is more appealing to enjoy wild backwoods dramatically than a lavish permanent spread out. 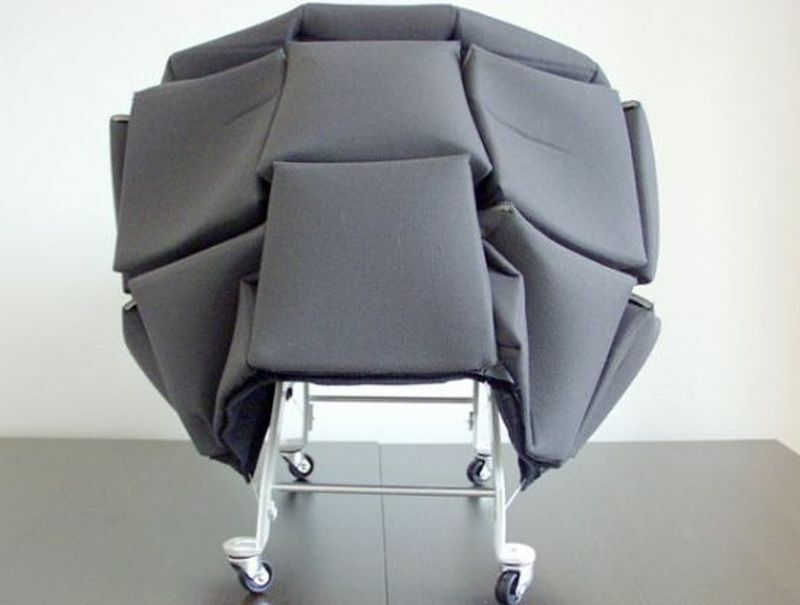 The Japanese designer, Hidemi Nishida, has turned this idea into reality. 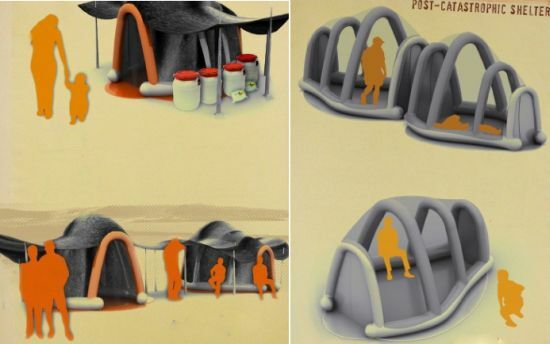 He has designed a temporary winter shelter called the Fragile Shelter. 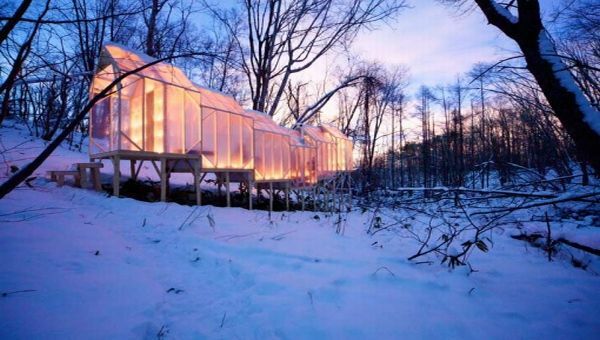 Located deep into the forests in Sapporo, Japan, the Fragile Shelter or the Shukaijo House consists of six identical temporary hubs. These serve as a perfect den to assemble friends and family over a night or day, out in the wilderness. This temporary architecture is inspired by simplicity and concern for natural surroundings. You can easily dismantle it without leaving any mark on the landscape. And it has no impact on the environment also. Designed by Japanese spatial artist and designer Hidemi Nishida the oblique shack stands on a stilted structure. It frames over an undulated surface above the average snow level. The tented roof and walls made of translucent plastic sheets hems the unit over the naked wooden basic structure. They give it a very rough and natural feel that heightens the mystery of the wooded landscape and extreme weather situation outdoors. The translucent cover not only keeps the inhabitants safe from the harsh weather conditions but also allows extra light and visibility. It engenders the feeling of being in the outdoors, but without being in it. The floor level is stepped up and down to match the undulating ground base. Furthermore, it also provides a spontaneous sitting accommodation to all visitors. The feeling of floating in the air while inside the hub enthuse people to congregate, make merry, have a good time, catch up on friends and family. In addition, it is also a safe haven for trekkers adventuring in the woods. The wooden frame and a small heater provided inside the structure also allows a warm luxury for those who are out at night in a snowy forest. 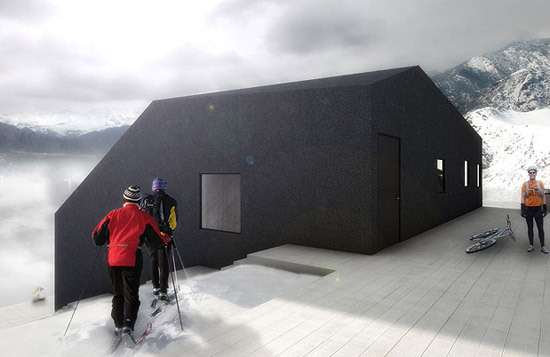 An entry at an architectural competition for Xella cellular concrete blocks, the “Snow House” by Nicolas Dorval-Bory Architect is an energy-efficient winter villa that seems to make your winter vacation more sustainable. Developed in collaboration with Emilio Marin, the winter cottage makes use of eco-friendly Xella aerated concrete blocks to catch the heat within its compact square plan for longer duration. Furthermore, two systems, the geothermal heat pump and trombe wall, work in tandem to pump fresh cold air from the exterior for heating. The trombe wall warms the air using a greenhouse effect during the day to spread the heat all around the house at night. A black waterproof roughcast coating other than maximizing the solar gain also reduces the amount of snow on the roof. Lying close on the ground, the house also features an open courtyard at the center to harness fresh natural and light air during summer. Moreover, the house makes use of natural slopes for better thermal insulation and distribution of heat. With a number people being displaced by natural disasters every year, the demand for temporary shelters is on the rise. Designed back in 2007, the Kahuta is transitional housing designed for post-disaster situations. 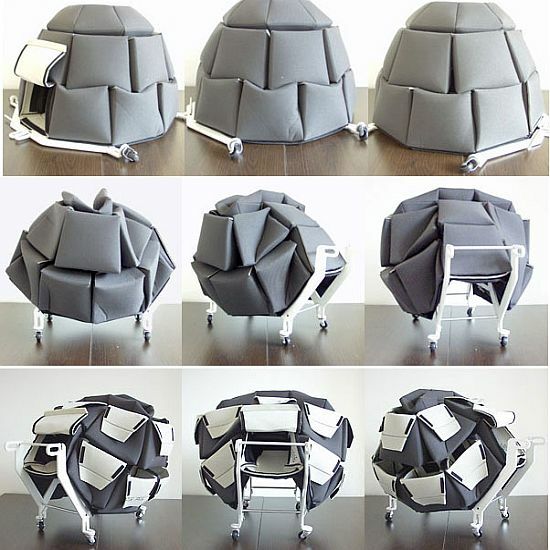 It’s basically an inflatable structure, which is easy to use and quick to set up. It can be either used alone or with other Kahutas to create a community. Inspired from the habitat of nomad tribes, the structure is covered with a web of double-thick felt, which can create an outdoor space for storage or assembly. Zeroing in on certain nasty realities of life, the Kahuta can be easily transported from one place to the other for emergency transport forced population.